Reservations are required for groups of 16 or more people whether or not you plan to use a covered picnic shelter. The park has two large picnic shelters available for reservations. Each seats about 75 people and includes picnic tables, charcoal grills, and power outlets. For indoor parties, the conference room in the Welcome Center is also available for rent. Rates are $50 for a half day or $100 for a full day ($25 and $50 for Friends of the Park). The conference room comfortably holds between 12 and 25 people, depending on furniture setup. 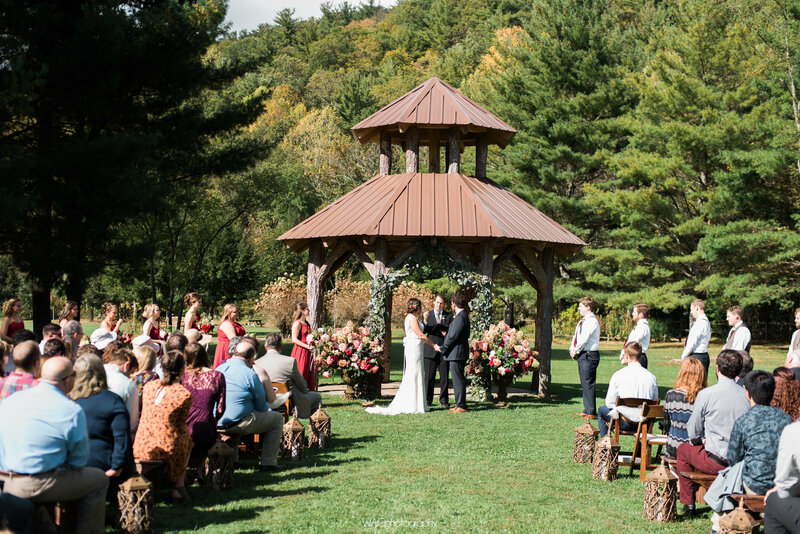 Churches and nonprofit organizations located in Valle Crucis, as well as Watauga County schools and government offices, are welcome to use the picnic shelters and conference room free of charge. A reservation is required. Churches and nonprofit organizations located outside of Valle Crucis will receive the Friends of the Park rate. Parties of more than 200 people are not allowed in the park. Please contact us for more information or to make a reservation. The cost for weddings in the park is based on the number of people attending as well as available a la carte services. All weddings held in the Park will pay at least the base price of $300. Please contact us for more details.